Tabby and Tim from Tennessee don’t know what they’ve gotten themselves into when they decide to stop for a quick bite at the Elbow Room Café on their way to Stanley Park. “Vancouver’s Famous Breakfast Café,” as the sign declares above the door, is run by partners Patrice and Bryan, a couple who loves to bicker and often airs their dirty laundry in front of the customers. The iconic real-life café is known for the tough love that customers receive from Patrice, and the do-it-yourself attitude when it comes to things such as coffee refills. 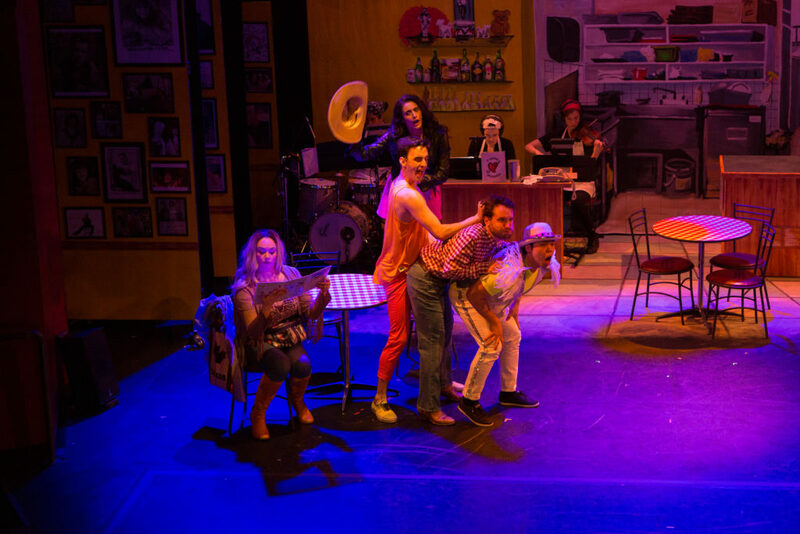 Tabby (Emma Slipp) and Tim (Steven Greenfield) are on vacation for their anniversary, and their reactions to the flamboyant, free spirited atmosphere of the Café is a highlight of the show. Also frequenting the Café is a bachelorette party gone wrong and the lonely Jackie (Christine Quintana) who is about to meet with her ex-girlfriend, Jill (Olivia Hutt). While these storylines do eventually coalesce to contribute to the main message of acceptance and open-mindedness, the transitions between them were at times awkward and felt a bit forced. The commentary about the role of a wife and it’s many manifestations was well done: Patrice is the “wife” of their couple and wants to make things official with a wedding; Tabby is the take-charge wife who doesn’t let Tim tell her what to do; and bride-to-be Amanda (Synthia Yusuf) sees becoming a wife as the end of her freedom. While some stereotypes were unavoidably exploited, they were also discussed directly instead of being passed over, which was refreshing. The best song, with Tabby leading the charge, was “Let a Girl Eat.” It’s a wonderful ode to satisfying those cravings and hunger pangs — something anyone who’s ever been hangry can relate to. Patrice and Bryan also share many tender moments including their reminiscent song “We Had So Much Fun” that gets reprised a couple of times. At the Elbow Room, everyone feels welcomed and free to be themselves, even if the staff swears at them and they have to get their own coffee. Honouring this unique part of the community and the café’s founders, while sharing a message about making the most out of the time you have, makes this musical a true local gem.